This recipe is sure to be a hit among elders and children. It not only tastes good but also looks good with a golden layer of cheese on top.. In a large pot boil water and add pasta to it. Cook until tender. 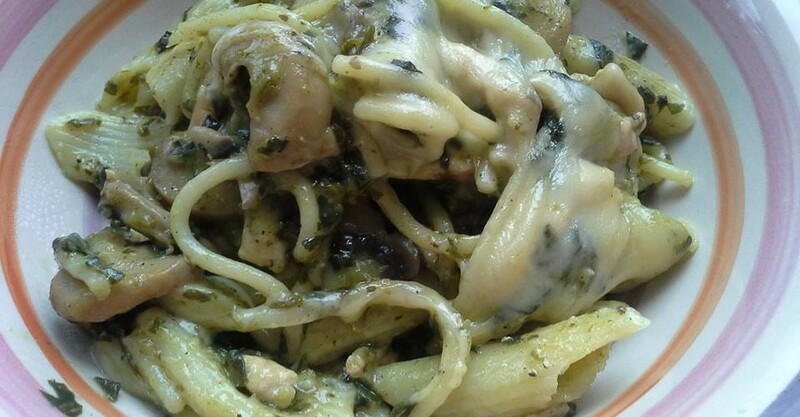 For this recipe i used Penne, which usually take 10 minutes to cook. Drain excess water and set aside the pasta. In a pot melt butter over medium heat. Do not cook on high heat as it will burn the butter. Add crushed garlic cloves to it. Fry for a few seconds and add white flour. Keep stirring. After few minutes the flour will change its color slightly, now add stock and mix well. Cook for 2 minutes. Add cream, mayonnaise, soya sauce and vinegar. Season with salt and pepper to your taste. Mix and add mushroom and spinach. Stir and cook for 15 minutes or until the sauce is thick. Add pasta and cook for 2 minutes. Preheat your oven. Take a casserole dish and add pasta to it. Shred some mozzarella or gouda cheese and sprinkle it over the pasta. Now put the dish inside the oven for 3 minutes. Serve hot.